After a disappointing meal at Loch Fyne restaurant last night which was not worth writing up, I kicked off Sunday morning with some buckwheat pancakes. Buckwheat is not made with wheat, despite its name. It’s a relative of rhubarb and is a tough, grey flour that is ideal for making pancakes. 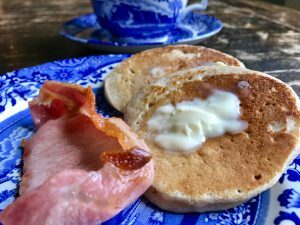 In the US it is the pancake flour of choice, so if you source some GF buckwheat that is guaranteed not to be contaminated, these are easy and delicious. Hooray! I bought my GF buckwheat from Sainsburys – the Rude Health brand. Also available in wholefood shops and possibly other supermarkets. Great with maple syrup, butter and fruit, but also tasty with some bacon on the side. Breakfast is looking up. Mix the dry ingredients in a a bowl. Whisk the egg into the milk and then pour it into the dry ingredients, keep whisking as you go. Add the melted butter and give it all a further whisk until the batter is thick and smooth. This batter will make “scotch” pancakes – if you want thinner, crepe style, you will need to add a bit more milk. Heat butter and a tiny bit of oil in a frying pan and then wipe round with kitchen paper (you’ll need to replenish the butter/oil a few times as you make all the pancakes). Drop spoonfulls of the batter into the pan, giving it a gentle swirl as you do, to make the pancakes circular. As the bubbles rise up through the mix, flip the pancakes over until browned. Keep on a plate covered lightly with foil, in a warm place, until all the pancakes are made. As with all pancakes, the first one or two are testers, but after that the pan settles in and you find them easier as you go.